These 30 litre shredder waste bags from Rexel are themselves recyclable - so can be recycled along with your shredded material. 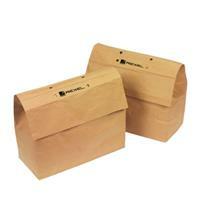 The sacks are also self-seal for tidy disposal. This is a pack of 20 bags, compatible with the Rexel Mercury RSM1130, RSS1627, RSS2030, RSX1227, RSX1630 and other select Rexel Mercury shredders with a 30 litre bin capacity.